While both employers and job seekers alike are looking for respective applicants and occupations that are the best “fit,” sometimes initial impressions are just flat out wrong. What do you do if you’re a month into your new job and already dreading the routine? While you may have genuinely made a bad job decision, there are several things to consider before walking away for good and ways to end the brief relationship without burning bridges. Starting any new job can be a bumpy transition. Not only are you tasked with meeting new people, adapting to a new workplace, determining a new set of expectations, and quickly assimilating new information, but the job can wreak havoc on your daily routine. Especially during the first few weeks, your anxiety and sense of confusion may be high but if you remain uncomfortable for a month or two, it could be time to consider finding another employer. When debating whether or not to quit your new job, ask yourself a few probing questions: Is my uneasiness just a result of the newness of the job? What can I earn from remaining at this job? Can the job description be altered to make it more bearable? Addressing these questions can help you get a better idea of why you are feeling the need to abandon your position. And if your complaints can be satisfactorily addressed, you may be able to renegotiate in order to stick with the job. But sometimes this just isn’t an option. Sometimes you know deep down that a job isn’t for you. If this is ever the case, don’t simply disappear without a trace. Take a look at a few ways to exit gracefully and respectably. While the easiest way to give your “notice” is to simply not show up, the bridges you burn and the respect you lose could hurt you in the long run. 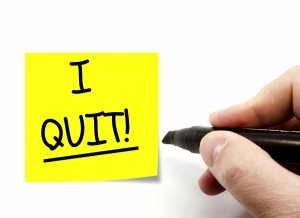 If something about the job just rubs you the wrong way or clashes with your principles, personally present a two-week notice to your manager while explaining that you would be more comfortable if you were allowed to quit immediately. This is especially relevant if you feel unable to perform a job correctly. If your primary complaint is one of boredom or confusion, talk to your manager first. You could either come up with a plan to improve your working conditions or come to the mutual conclusion that the job is simply not a good fit. You should still offer a two-week notice, but odds are you can probably arrange to leave sooner. Consider all other options first before deciding to leave. Also, before making the commitment to quit your job, make sure you can support yourself before putting in your notice. And even if you’ve already found another job, if you have benefits already set up at your current employer, it can take months for them to transfer over. The moral of the story here is to make sure you are making the right decision when accepting a job offer. Ask lots of questions before making your decision and get a real understanding of the position that you will be walking into. The more you know ahead of time, the more comfortable you will be with your choice.